Greetings, aspiring misthios! We’re all oh so excited to jump into the dawn of Western Civilization and go stabbity on shadowy conspirators and mercenaries and bears. 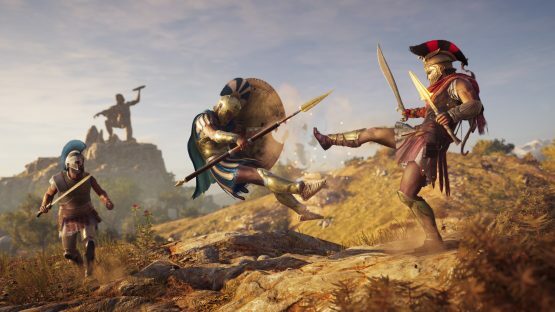 Assassin’s Creed Odyssey follows the skills tree tradition started a few entries ago. Your character can upgrade his/her abilities as soon as ability points are earned. Some abilities only unlock at a specific levels, but their price point is all the same: one ability point. There are three categories of skills: Assassin, Hunter, and Warrior. Assassin has all of the stealth and, well, assassination abilities; Warrior provides the skills necessary for close combat; and Hunter focuses purely on ranged skills, aka your bow. The Hunter encompasses everything from bow strength, bow abilities, and scavenging from animals. It’s a big of a hodgepodge for sure, but it has a lot of hidden gems of skills within. In theory, it’s possible to level up enough to unlock all of the abilities and all three levels of each ability. All it takes is patience and dat grind. However, there are quite a few abilities your misthios should unlock as soon as possible, to make the experience (and the grind) as smooth as possible. Thus, before you attempt that death-from-above assassination (personal favorite to this day), make it a priority to focus on these skills first. Then you can branch out and mold your mercenary to fit your preferred gameplay style. 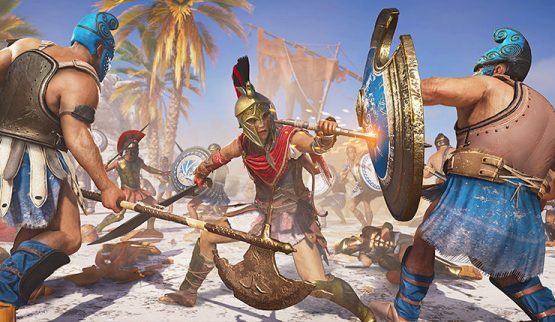 After playing as Leonidas in the beginning, you’ll not only want this for your own kicks, but you’ll also find how necessary it is to defeat strong enemies. Trust me, there is nothing like luring mercenaries and other boss-esque enemies up a cliff, just to kick them off and hear their screaming as they fall. If it doesn’t kill them, they’ll just climb back up so you can do it again and again. Better make sure you have plenty of adrenaline in stock first. Also, a well-timed Sparta Kick can interrupt an enemy’s charged attack. All this ability does is increase your assassination damage. It’s so simple, yet it’s so important. Not all enemies are susceptible to insta-kills via assassination. Increasing this ability helps ensure successful assassinations against captains, commanders, and polemarchs. I admit it’s rather frustrating that arrows to the head are also not insta-kills. They kind of would be in real life, right? I know this is a video game, but it makes sense that headshot = death. By unlocking the Devastating Shot ability, arrows will deal at least 290% of hunter damage. If your arrow is fully charged (pulled taut), it’s possible to deal twice as much damage. It’s the first of many steps to become a powerful sniper. This passive ability slows time for five seconds when you’re first spotted, giving you time to either slit that unlucky soul’s throat or line up a deadly shot to the torso. Torso shots grant 175% of hunter damage when the Sixth Sense is active. With each additional upgrade, you have greater damage and more time. As I mentioned earlier, assassination attacks don’t always instantly kill your target. By holding the assassination button down, you can trigger a critical assassination for even more damage. Even if your target is a captain, and your HUD says that it won’t be a critical assassination, but a critical stealth attack—insinuating you can’t kill this one by assassination—you can potentially deal enough damage to kill him regardless. Level both this ability and the Shadow Assassin ability early and often if you prefer the assassination route over open conflict. If shields are keeping you from your full potential in a fight, yank the shield away from them and smack them across the face with it. Doing so also stuns enemies for few seconds. As you level this one up, no shield will hinder you. This ability is especially important if you plan on taking part in Conquest battles. With this ability, you can craft various arrows, such as paralyzing, poison, and (my favorite) fire arrows. Sometimes the only way to take down an enemy is to just set them on fire. At least, it’s the most fun way. The following skills aren’t must-haves, but they’re extremely helpful nonetheless, especially for completionists. Venomous Attacks – Instantly coat your weapons with poison that will weaken your enemies. If the ability is high enough, it can kill them. The best part about this skill is that it doesn’t require any adrenaline. It does have a long cool-down period, though. Rush Assassination – You can quickly close the distance between you and your target for an attempted assassination with your spear. I say attempted, because this will kill soldiers quickly, but not captains or mercenaries. It will, however, greatly damage them. Revelation – By holding down the up directional button, you can scan the area around you. At its base, it marks any items you can loot or steal. When you level it up, you can highlight treasure chests, other collectibles, and eventually the locations of enemies. It won’t replace summoning Ikaros, however. Nothing can beat that bird’s tracking and marking skills. Archery Master – Level this ability up, and you’ll greatly increase your hunter damage overall. Second Wind – If the chips are down, activate the Second Wind to regenerate 25% of maximum health. This is a must-have if you’re doing Conquests or like to fight fort soldiers in the open (you maniac). You’re essentially a one-man/woman army out there, and you’ll need all of these plus their upgrades to survive everything Greece has to throw at you. May your bounty be plentiful.